Squaring walls before standing them is a rather simple process. Whenever possible, exterior walls should be squared up, sheathed, and house wrap applied before being raised. Any carpenter is more efficient standing flat footed on the ground, therefore all work that can be completed on the ground should be. We've all seen an 1,800 square foot ranch seem to go up quickly, heck they stick framed all the walls in a single day. Wait a minute, where is the second top plate, wall ties, sheathing, and house wrap? They are actually only half done and aren't nearly as fast as they think. Leaving off the second top plate will cost you at least twice as much time and money. If the top plate had been applied while the wall framing was still laying on the deck, one carpenter could have cut and nailed it on in a matter of a few seconds. Now it will require at least two carpenters a few hours of head scratching, measuring, climbing ladders, and untangling air nailer hoses. Not squaring walls will cost you even more time due to using a level to plumb up corners. Every carpenter has been there, this way, awe too much, and oops wrong way. Not to mention all the extra temporary sway braces that will have to be removed later. Leaving off the sheathing will also cost you more in the long run. What one carpenter could have done in 15 minutes on the deck will now take two men an hour. I won't even talk about slogging around in the mud or those windy days. Large house wrap rolls are easy to roll out flat (horizontally) on the deck just like carpeting. Take that same roll vertically and you've got a whole new ball game. "I won't even talk about slogging around in the mud or those windy days." 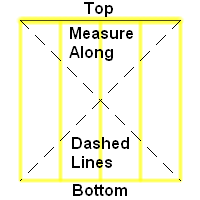 Plumb, level, and square is one of the oldest and most basic rules of carpentry. If the surface the wall framing rests upon is level (horizontally) and square (mathematically) it will be plumb (vertically) when raised. To look at it another way, if it is plumb and square it will be level. This basic rule has worked for centuries, even Jesus Christ the carpenter probably used it. I would even bet that Jonathan Prine's Grandpa of "Grandpa was a Carpenter" fame used it. 1. Insure that bottom and top plates are the same length. 2. Place and nail bottom of wall on line, so that when raised it will be in the proper place. 3. Measure diagonally from outside corner of bottom plate to outside corner of top plate from both directions. 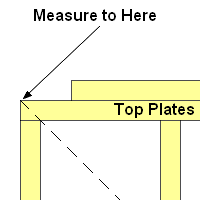 Move top of wall back and forth until the same measurement is obtained both ways. This may require three or more tries to get it right. 4. Tack a toe nail in top plate to keep it from moving and apply wall sheathing.